More than £5m of lottery cash is being given to schools across the West Midlands to improve their sporting facilities. The £5.3m award from the New Opportunities Fund will benefit 13 schools, among them Bordesley Green Business and Enterprise School in Birmingham. It is receiving more than £1m to create a new four-court sports hall that will provide facilities for netball, volleyball, cricket and dance. The project will benefit 600 pupils at the school, 200 pupils from other schools, including a local ethnic minority school, as well as about 40,000 community users. The school's deputy head teacher, Linda Driscoll, said: "We are delighted that our bid for New Opportunities Funding for a sports hall has paid off. "It is a dream come true for the staff and pupils who put so much hard work into the bid." Just over £1m is being awarded to Kingstone School in Hereford to be spent on a four-court sports hall. 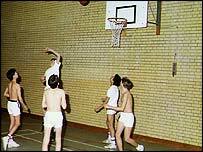 Activities offered include basketball, dance, badminton and table tennis. The facilities will be available to the wider community at evenings and weekends. Another large cash award is being made to Colton Hills Community School in Wolverhampton, which is getting more than £550,000 for new changing rooms, and to modernise its swimming pool. The new facilities will benefit 1,120 pupils at the school, nearly 5,500 pupils from other schools, and about 5,000 community users. Other recipients of lottery money include two Shropshire schools that are sharing more than £800,000. Brockton Church of England Primary School in Much Wenlock and The Corbet School in Baschurch are both building new sports halls. And more than £60,000 has been awarded to Kingsmead High School in Cannock, Staffordshire, to improve the surfaces of its playing fields. Who spends 'our' lottery money? Can school sport be saved?